i’ve always been so fascinated by all things japanese – everything from candy, to fashion, to cosmetics; everything about the culture is so impressive to me. the japanese always seem to always come up with the most cutting-edge products and present them so beautifully. what does tsuya skin serum do? in ideal skin, cells have the ability to restore and protect itself day after day. that’s why baby’s skin is so perfect, pore-less and plump. but with age and fatigue, our skin looses its ability to do so, which is why our skin begins to loose its structure and becomes dull. 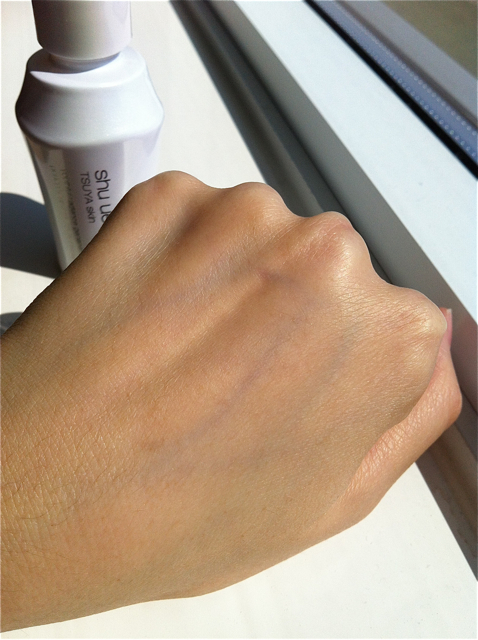 this is what shu uemura calls “power-cut” in skin cells. for young skin, the receptors on the skin cells receive signals to switch on the self-generation process and once this happens skin begins to produce more youthful molecules. but as we all know, as we age or as our skin becomes stressed, it’s unable to regenerate as it used to. shu uemura labs found one receptor that remains intact throughout the aging process and has identified one molecule that stimulates this receptor to re-active the “power switch”. 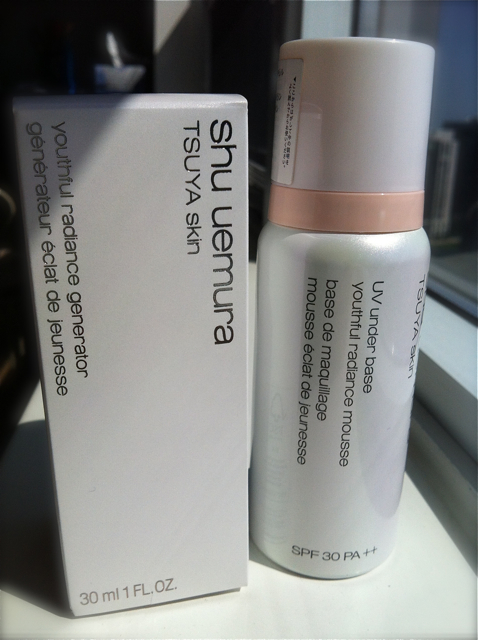 shu uemura uses rhamose which is the miracle molecule that can re-active your skin’s youthful power swith. this means that it encourages your skin to regenerate. it also evens out your skin tone bringing the pink tones back, as skins becomes dull with age. 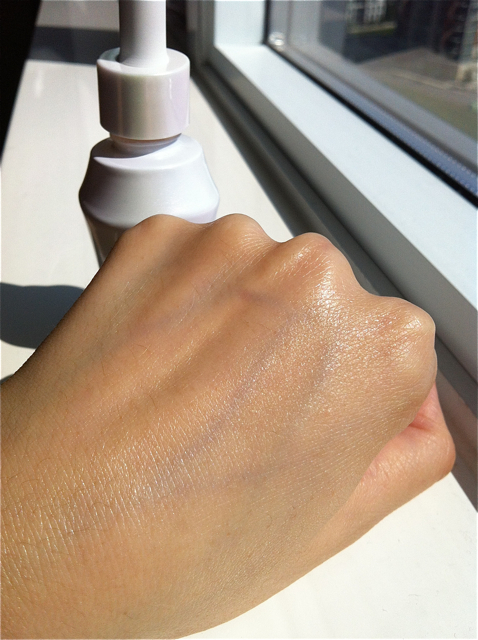 i did a test on my hand to show the instant results of the product. i was so excited to receive the serum and the uv underbase mousse. i’m going to begin my 7-day trial! 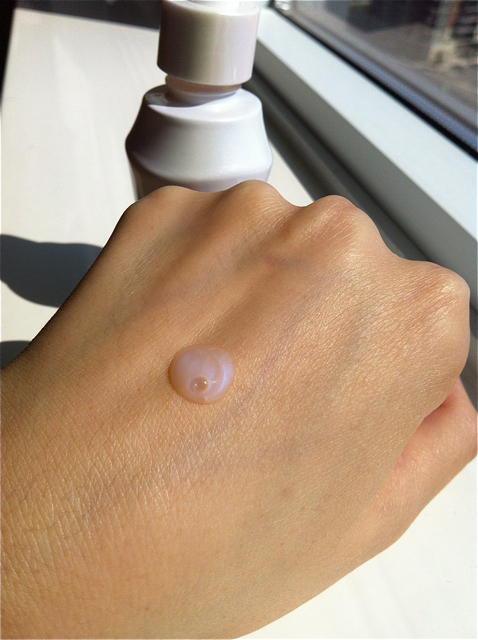 the tsuya skin serum is a beautiful pearly violet-pink with a light floral scent. violet and pink are colours that are usually used in makeup bases to instantly correct sallow skin. 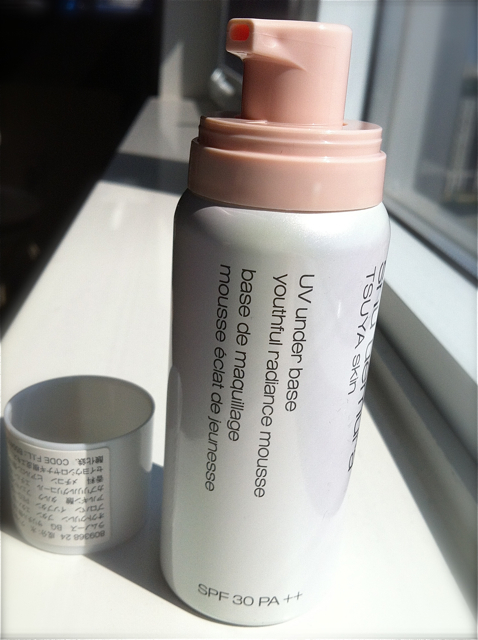 with this being said, tsuya skin also has a new uv underbase mousse. it also contains the rhamnose molecule and this new formula is more moisturizing with the same light floral scent as the tsuya serum. i’ll tweet some updates on how my skin feels after the 7 days! to follow me on twitter, click the button to the right! 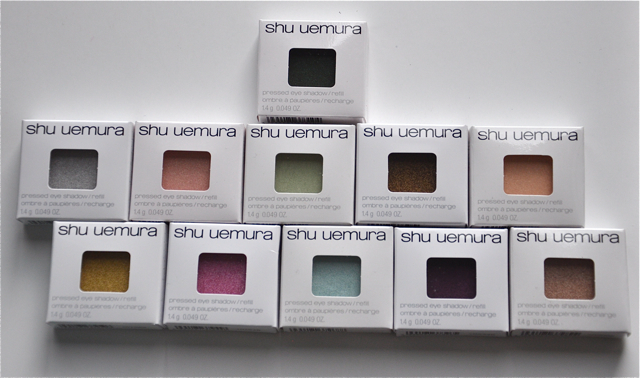 i’m always so excited when shu uemura comes out with a new collection! each collection is always designed with art, beauty and quality in mind. from the packaging, the colours and the textures to the intricate details of the false lashes, everything is always so beautiful with a story to tell. this fall season, talented international artistic director mr. kakuyasu uchiide came up with an elegant collection called chocolat-donna featuring two glamourous nail polishes, three eyeshadow palettes, two blushes and a set of partial lashes. when i was in paris with uchiide-san, he explained that he wanted to design a collection that would be a gift to women. what better gift to give to a lady than beautifully fashioned chocolates? 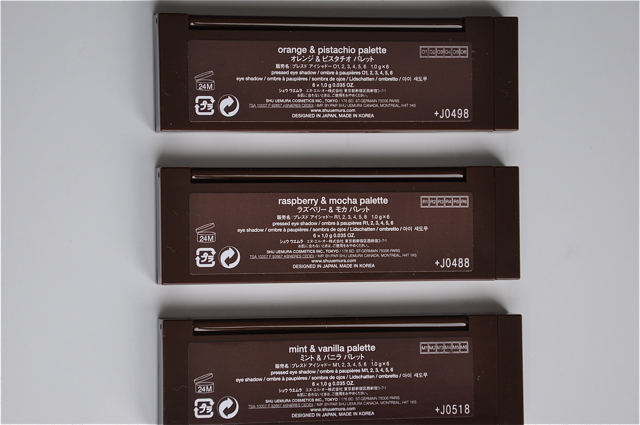 uchiide-san was inspired by chocolate and champagne pairings and used his favourite flavours to come up with the unique chocolate palettes: orange & pistachio, raspberry & mocha and mint & vanilla. 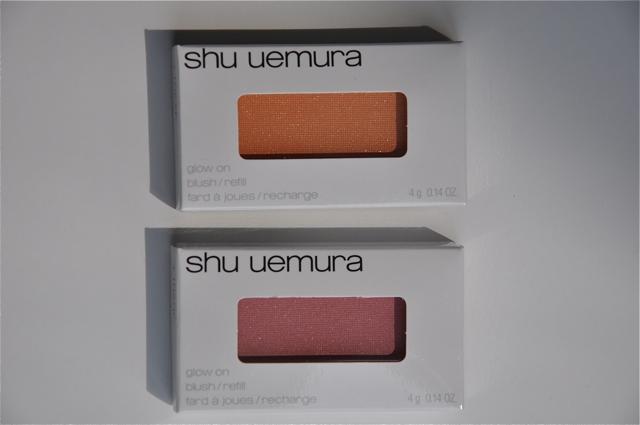 these palettes are also refillable with any regular sized shu uemura pressed eyeshadows. 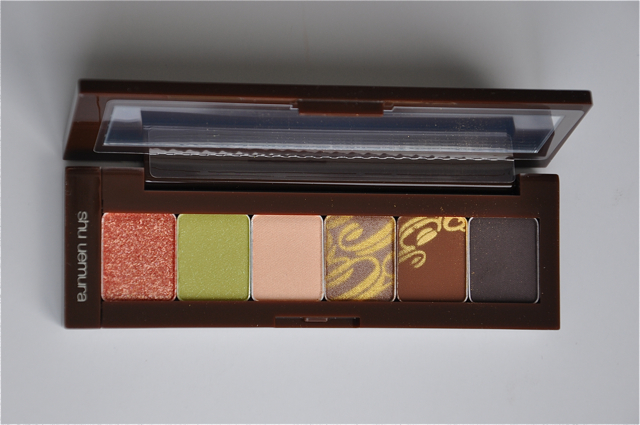 this palette includes a glittery orange shade, a pearly pistachio green shade, a pearly peach shade, a cool metallic brown, a matte light brown and deep matte brown. the textures are always amazing. highly pigmented and glide on smoothly. i can’t ever go back to using any other brand of eyeshadow! other makeup artists can surely agree. 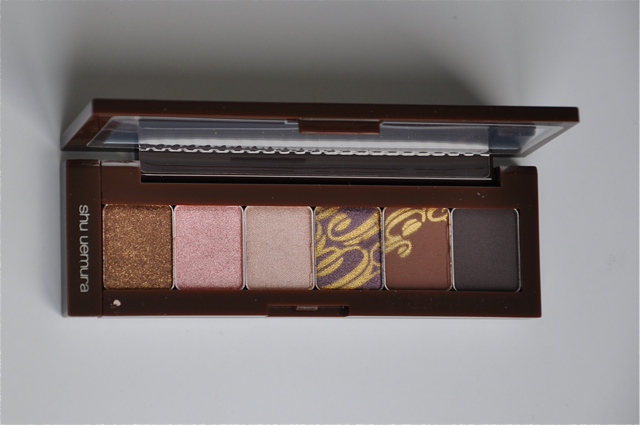 this palette has shades of glittery brown, metallic pink, pearly pink, metallic plum, matte light brown, deep matte brown. 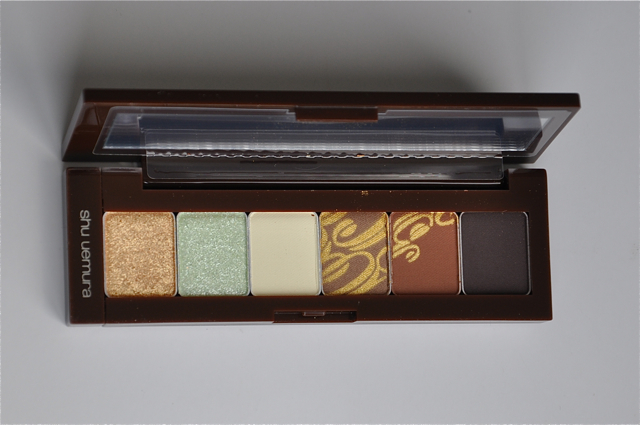 this palette has shades of: glitter gold, glitter mint green, matte beige, metallic warm brown, matte light brown, deep matte brown. simply apply two coats of the rich chocolate shade to your nails, then apply the glitter polish to the tips the perfect diy manicure. it’s like having a glass of champagne with some dark chocolate truffles. these pearly glow ons are like the rest of shu uemura glow ons: perfectly smooth and finely milled so they create the most natural glow. 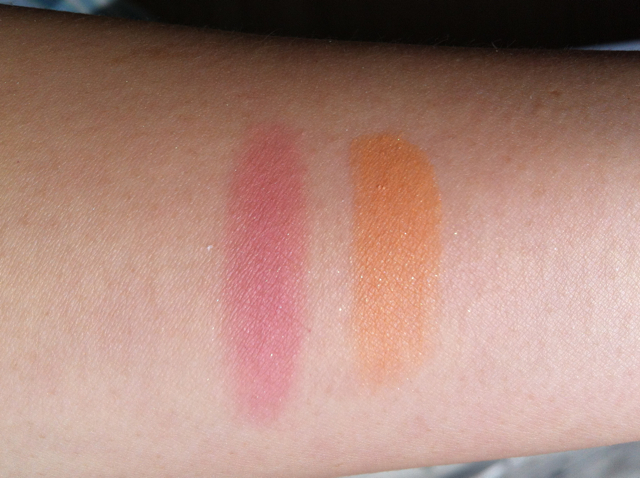 you can wear these shades alone (i particularly love using apricot shades of blush on deeper skin tones) or wear them together. i suggest applying the raspberry shade to the apples of the cheeks then softening buy applying the apricot shade over top. of course, to complete the collection, a pair of dainty partial lashes with golden detailing. these lashes are so easy to apply and make lashes look instantly fuller because of the feathery finish. when eyes are open, it adds fullness to the edges of the eyes and when you blink, there a glimmer of gold – so pretty! the chocolat-donna collection is perfect for creating simple daytime looks that easily transition to glamourous evening looks. 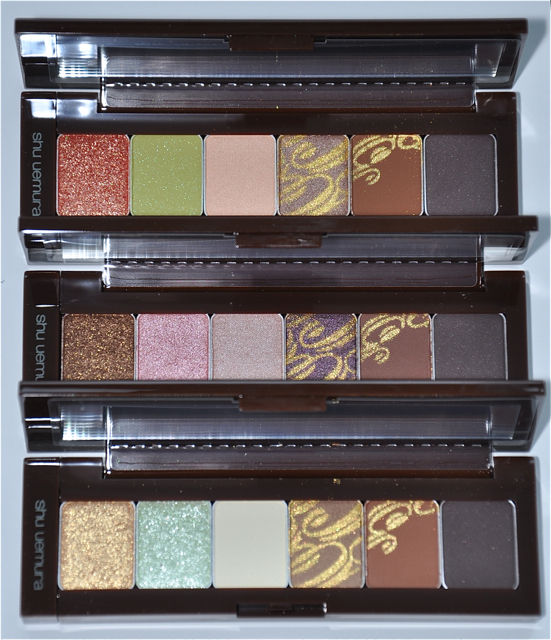 i love this collection because it’s extremely wearable and i absolutely love that all of the palettes come with a lighter and a deeper matte brown eyeshadows which is perfect for contouring. i’m also a sucker for collections, so the fact that the palettes are reusable/refillable with the regular shu uemura pressed shadows is a bonus! this collection is available as of august 2012 in holt renfrews locations across canada so pick it up before it’s gone! i’ll be creating some looks on myself using the palettes and lashes; remember to check back! at age 30, i feel like my skin has been acting up lately like when i was a teenager! i’ve been chatting with several of my girl friends and reading some articles and it seems very common that our skin tends to become more acne-prone when we enter our 30s even if our skin was fine after our teenage years. it’s either this, or because i’ve been traveling more lately so the change in environment, diet and rhythm have been irritating my skin. my skin has been getting little bumps although it’s not oily at this moment. everyone’s skin is different, for myself, my skin tends to break out in little bumps when i’m stressed or not getting enough rest. i get occasional cystic pimples when i have hormonal fluctuations. how sad… although i can’t avoid these things, i have found ways to manage my skin issues (i have a couple of previous blog posts about my skin care regime). 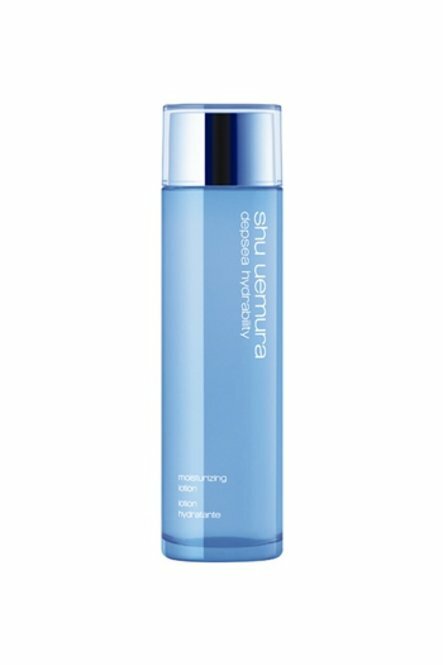 currently, because i’ve been getting a lot of clogged pores that causes little bumps, i’ve begun using the new shu uemura porefinist gentle foaming cleanser. i’ve been using it for about 2 weeks now and it’s really helped to calm my skin. because it contains salicylic acid, which helps to eliminate dead skin cells, i find that it’s helping the clogged gunk (causing bumps) to come to the surface and to come off. i normally go for facials, so i’ll be going in a couple of weeks to get a good pore cleaning now that the dead skin is starting to shed off. salicylic acid – this is the key ingredient for me personally. it eliminates dead skin cells so my skin looks brighter and it prevents gunk to clog my pored which causes bumps. 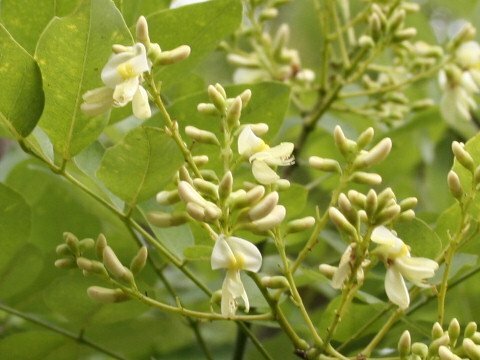 dragons beard extract – this is a moisturizing agent. this is what i feel makes the product better than other acne cleansers because my face doesn’t feel tight after cleansing. it feels fresh. 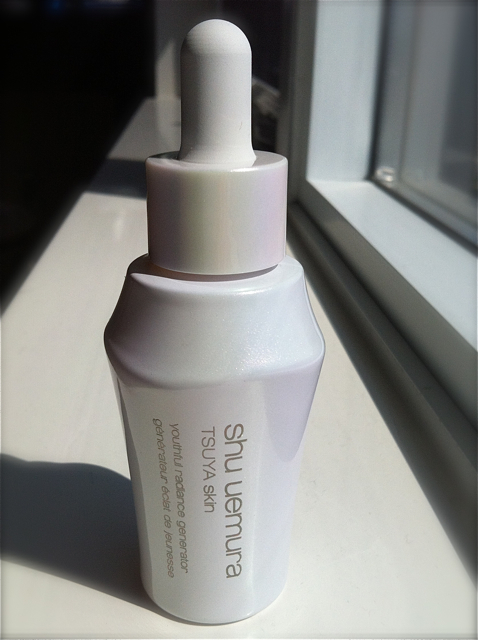 depsea water – i’ve talked about this in previous blogs, as it’s the key ingredient in all shu uemura skin products including foundation. 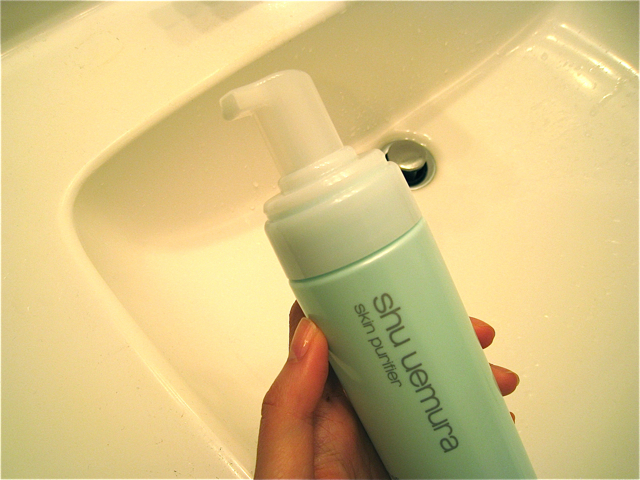 it’s patented by shu uemura and was discovered by mr. shu uemura himself when he was in japan by the sea. he noticed a nurse who brought some children to swim in the sea water near moroto cape and asked the nurse what she was doing. the children had eczema and she said the water was healing their skin. after researching, he learned that the water circulating with the currents deep under the sea to the polar regions had picked up lots of mineral and nutrients which naturally heals and moisturizes skin. to read more about the history, click here. it can be used dry or wet (so you can wet your face first, or not). i’ve been using this instead of my cleansing oil lately, just because my skin has been bumpy. so like i always say, choose to use products based on your skin’s needs at a particular moment. at night, i use 2-3 pumps on dry skin so that i can remove my makeup. in the morning, i find i just need one pump, since there isn’t anything on my skin. 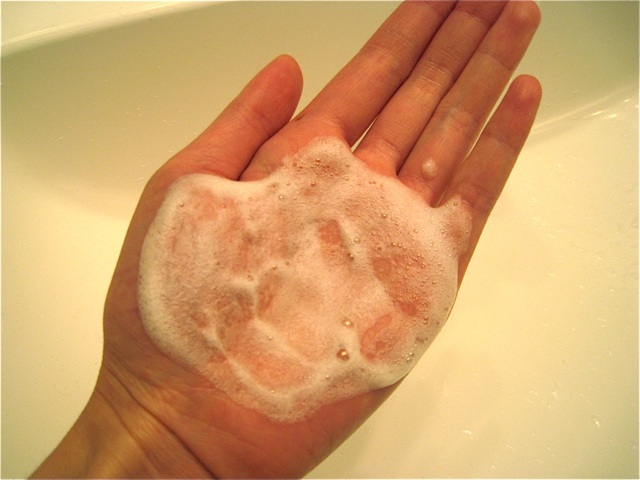 when it lathers, it feels soft and has a slight silky texture. scent is not strong – it’s more fresh and not floral. that’s what the pump looks like. this product was also designed to be eco-friendly. just in time for summer! 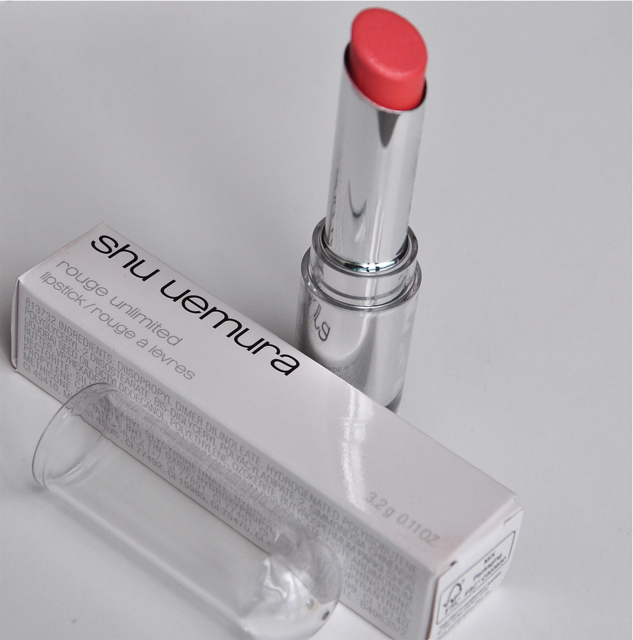 shu uemura has released two new great products that are both waterproof. great for the humid summer months and outings to the beach. shu uemura stretch xtreme mascara. this mascara is a fibre mascara that’s waterproof. you can paint on layer after layer to achieve the desired volume and length for your lashes! the wand is also slightly curved so it fits nicely onto the lash line. this mascara was actually designed with asian lashes in mind, so that bristles on the wand grab onto the smallest of lashes and builds volume for sparse lashes. shu uemura brow manicure. 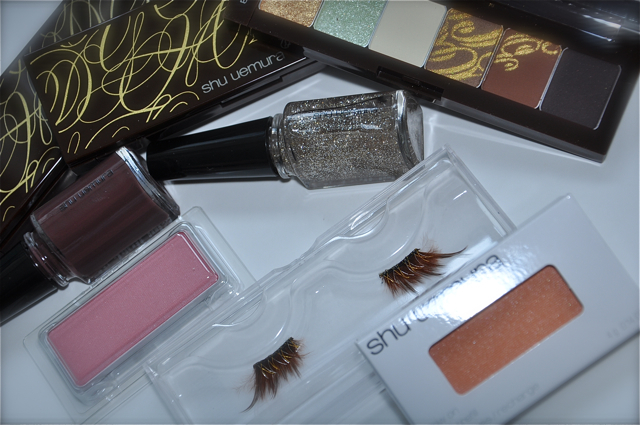 i have been waiting for shu to come out with a brow gel! it’s finally here! it’s sweat-proof and waterproof. it comes in two colours: honey glaze and ash brown. it has a handy wand with bristles designed to create the perfect brows. one end has shorter bristles to paint each brow (brushing the hairs upward) and the other side has longer bristles to brush the brows into place. 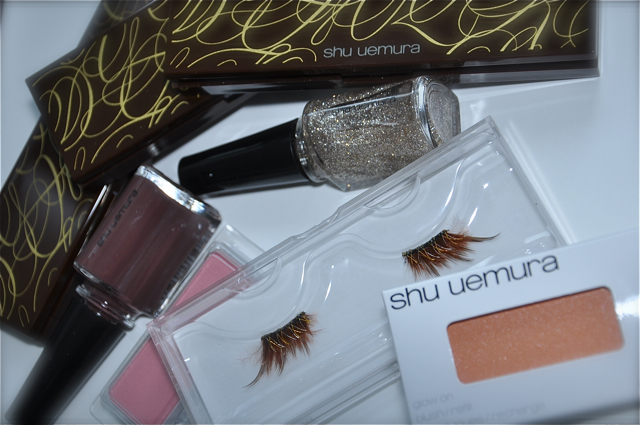 i like to use this product in combination the the shu uemura hard formula (brow pencil – i use colour seal brown). i soften the colour using brush 6OB (angled badger hair brush designed for brows). My brows are quite sparse so I draw in the shape with the hard formula pencil, then paint my brows with the brow manicure to really give colour to my brows and to put them into place since my brows, like most asian brows, grow downwards. i don’t like to trim them because i don’t have very many hairs as it is, so i prefer to brush and place them aside using the brow gel. here’s a photo with my right eye’s lashes curled using the shu uemura lash curler and coated with stretch xtreme mascara (3 coats). i also coated my bottom lashes (2 coats). my right brow is also done with the hard formula brow pencil and hairs painted and set in place with brow manicure. a very natural finish. what a big difference it makes! for more length, i could’ve continued layering the mascara for a more dramatic effect. try it! it really opens up the eyes. i love traveling. i absolutely have the travel bug! but the one thing that i dread most about traveling is break outs. because of the change in environment, diet and time zone, my skin tends to get quite bumpy whenever i travel. the worst is when i get those big pimples deep under the skin that take forever to heal. good news is, i FINALLY found a way to prevent travel break outs! 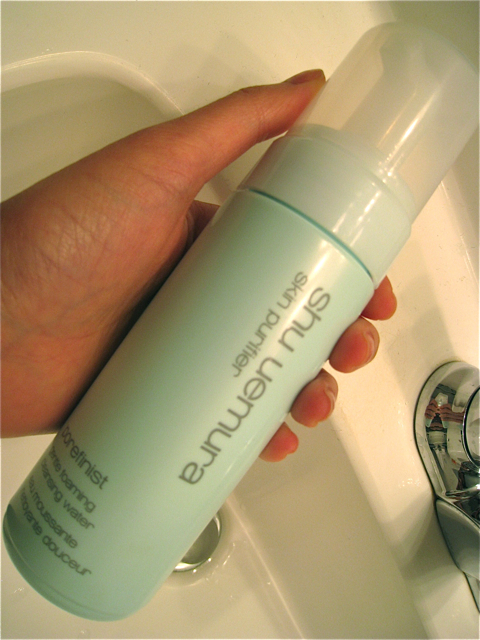 during my visit out west for shu uemura, my skin began to get bumpy as soon as i landed in vancouver – the airplane tends to do that to my skin; i’m convinced it’s all the bacteria! but i could be wrong lol – but luckily, national trainer for shu uemura lori lucas shared with me a simple trick to heal the skin so quick and prevent break outs. lori is a wealth of knowledge when it comes to shu skincare! use LOTS, i mean LOTS of toner! i used to try to limit what i put on my face because i was scared it would irritate my skin, but actually, it really calms it down. i used two cotton pads of toner morning and night. use shu uemura award winning hydrability alnight quench SOS moisture essence. it’s basically an instant facial mask. i call it a face mask for lazy people.. lol.. because you just smooth it all over your face before bedtime and you don’t need to wash it off. it’s got a high concentration of our famous depsea water (glacial water extracted from polar regions containing lots of natural minerals from deep in the ocean). don’t be afraid to put lots on! your skin’s texture will be improved dramatically over night, i swear! spritz lots of depsea mist during the day. i also had a small bottle that i used on the plane. the re-filtered air tends to really dry out the skin and make it flaky. the skin will them produce more sebum which i find breaks out my skin. this restores moisture to the skin and calms it down. what you’d be doing is normalizing your skin; helping it maintain balance. we tend to get dehydrated when traveling because we don’t drink enough water or eat enough fruits and vegetables. when we don’t drink enough water, we’re not expelling the toxins from our body. 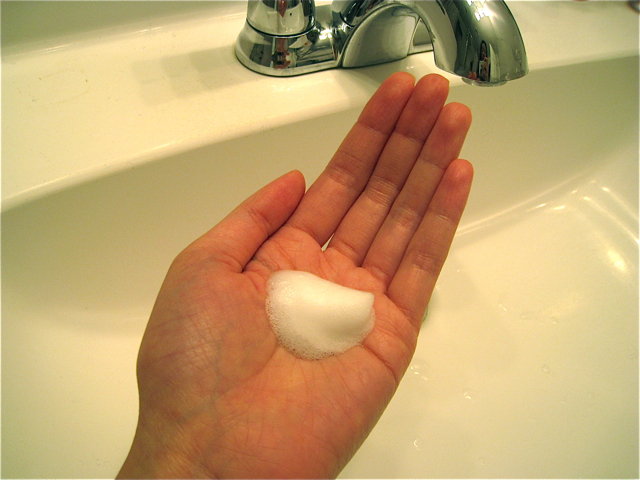 the toxins need to come out from somewhere, so that’s why we see it appearing on our skin. how sad. but i finally found a way to prevent all of this! feeding my skin depsea water throughout the day and night really prevented the bumpy skin! i couldn’t believe it. i’m so happy that i finally found a way to keep my skin nice even when traveling. try it! it really works! go to any of the holt renfrews across canada and discuss with one of the beauty experts at the counter. test it out, trust me, you’ll love it. 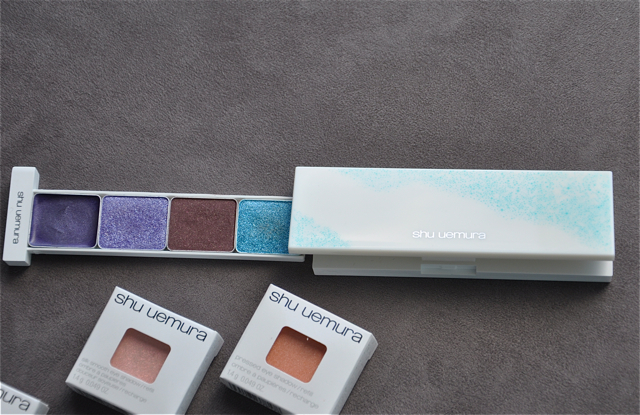 i’ve been having so much fun playing with the new shu uemura eyeshadow textures. 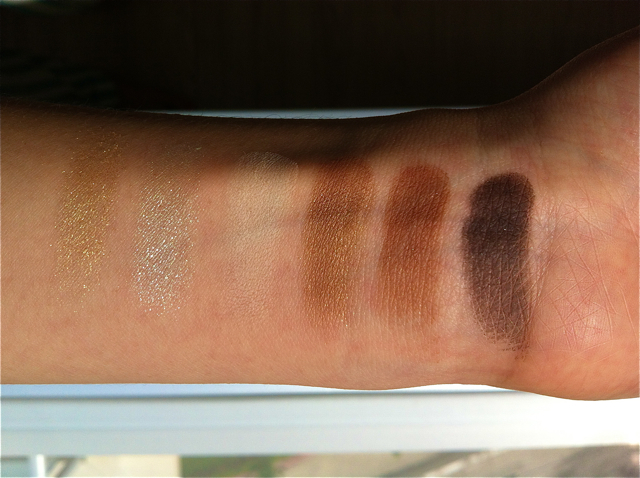 there are 3 new silk cream shadows which can be worn alone, as a base for shadows or overtop shadows and 6 new cream eyeshadows. these are perfect for enhancing the new glitter shadows and help to prevent eyeshadows from falling onto the face during application. use brush 10 and apply P deep plum 790 to the inner and outer parts of the eye to contour the eyeball and create dimension. 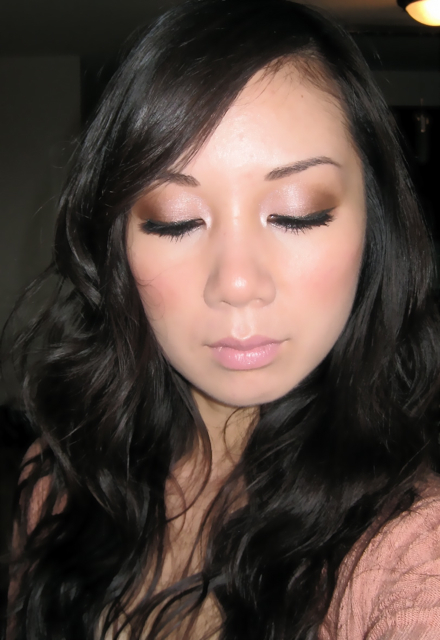 *tip: use eyelash curler to curl the luxe black lashes first, BEFORE applying them on your lashes. this gives the falsies a really good lift and it really widens then eye once applied. 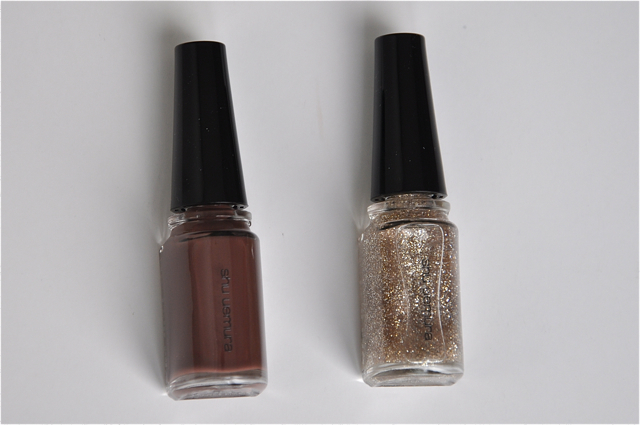 *the tools that you use to apply shadows are even more essential when working with glitters. the best shu uemura brushes are made with kollinsky hair (asian mink) which is very porous. it picks up colour and deposits on the lip minimizing any fall off onto your cheek and gives high colour intensity. the new stretch xtreme mascara is waterproof. it’s a fibre mascara so you can keep applying to build length and volume. i used new shu uemura brow manicure. i absolutely LOVE this new product. the little brush has 2 sides, one with shorter bristles to paint each brow (sweep upwards) and other side with longer curved bristled to put the brows in place. best part is that it’s water and sweat proof! just in time for summer! 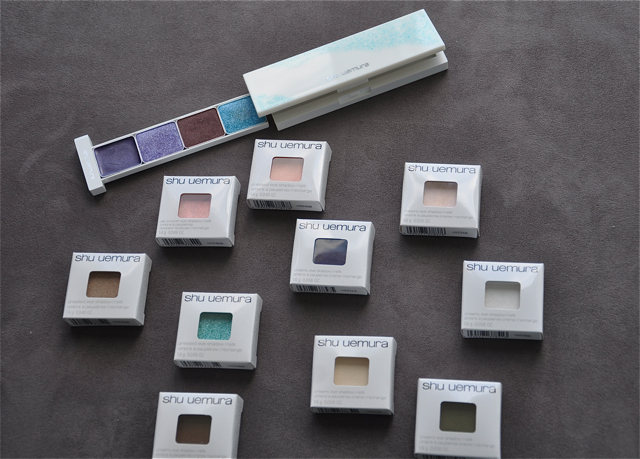 shu uemura just launched new shades of eyeshadows! 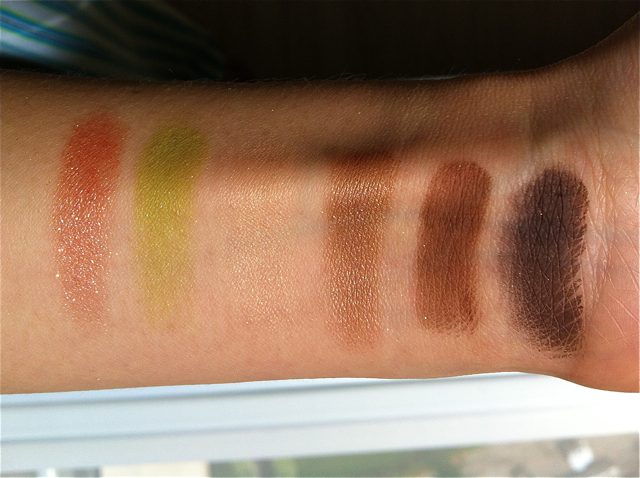 for those who love shu eyeshadows, you know how beautiful the texture is. 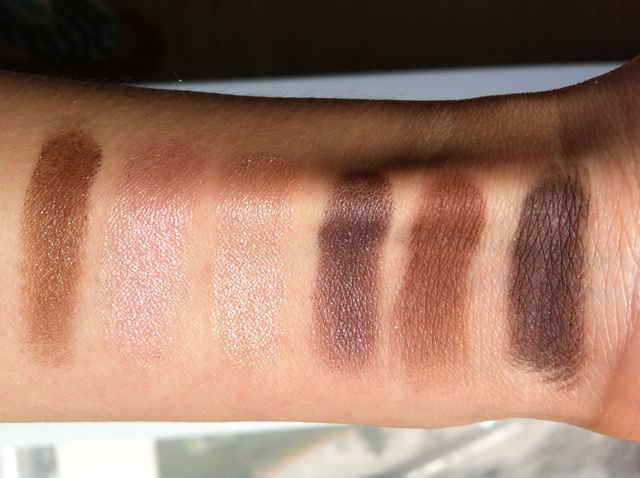 it’s the best eyeshadow out there; it’s made up of minuscule powders to adhere firmly to the skin, so it goes on super smoothly which gives the appearance of a creamy finish. with all the pinks and corals that we see this season, try creating a soft coral look for this summer season. i was recently in japan and noticed all the girls with bright pink and peach cheeks and fluffy eyelashes; this is such a sweet, dolly look which is what we’ve been seeing on the runways as well. for even and fresh looking skin, i used limited edition shu uemura bb beige uv underbase (SPF30) from the mamechiyo collection. (bb stands for blemish balm; it has higher coverage to even out skin and improves the texture of skin over time). 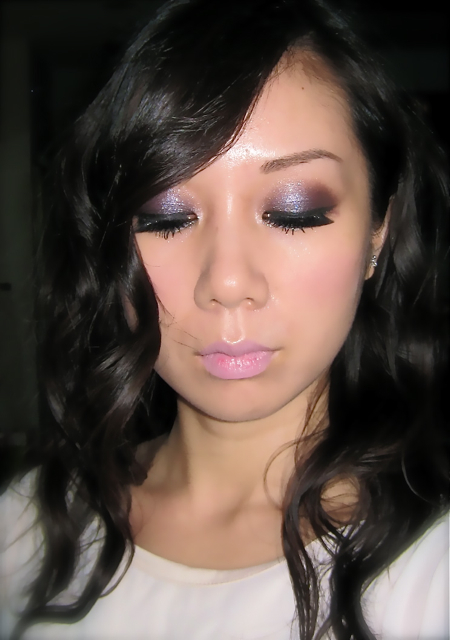 then i used shu uemura face architect glowing fit powder foundation (which contains SPF26) in 564 (medium light sand). a powder foundation for summer time is great, it’s mattifying and doesn’t feel heavy. use brush 20 and apply shu uemura glow on M medium peach 561 to apples of the cheeks (for dolly look apply more colour to the centre of the apple and create a gradation extending outwards). 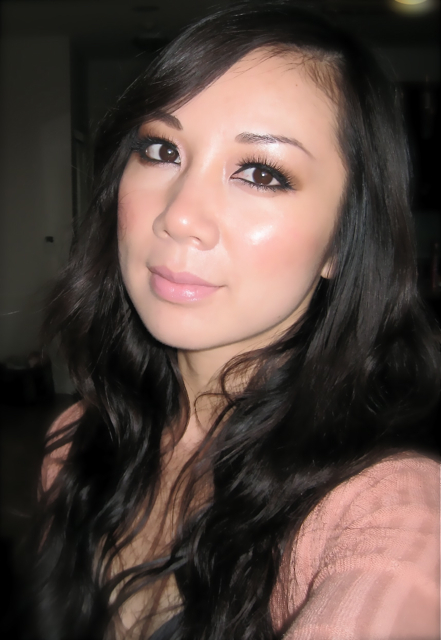 use glow on P light peach 510 to highlight cheekbones, bridge of nose and under eyes. use drawing pencil in brown and line upper and lower lash line and smudge/soften with finger. 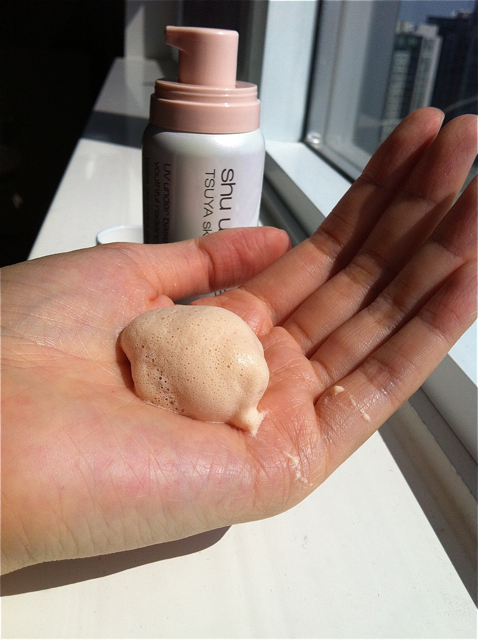 use brush 10 and apply P light coral 131 all over lid. tip: start from lash line and create a gradation upwards covering the entire lid. use brush 11 and dab a small amount of P dark brown 895. use this to soften the edges of the medium brown shade. use brush 11 and apply P light beige 822 to brow bone and blending into the P dark brown 895.
use brush 10F (flat brush) and press P medium brown 875 into outer 2/3 of lower lash line. use brush 10F and press P light coral 131 to inner 1/3 of lower lash line. (tip: if you have dark circles, apply you can extend the coral shade lower than the inner corner of your eye; this will reflect light which reduces the darkness). use brush 2R and black painting liner to line upper and lower lash line. don’t forget to fill under and in between your upper lash line to create an appearance of a fuller lash line. 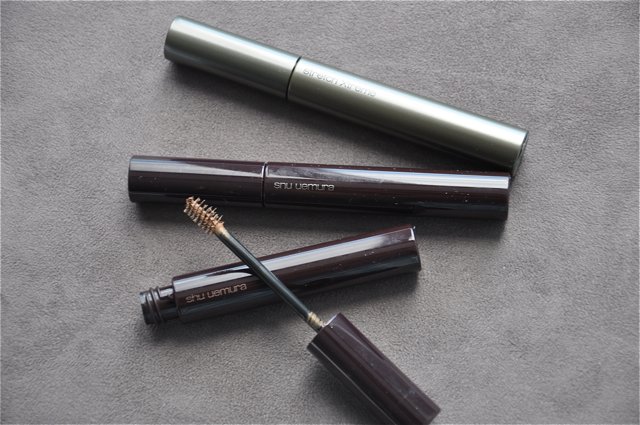 curl lashes and apply shu uemura ultimate expression mascara to upper and lower lashes. 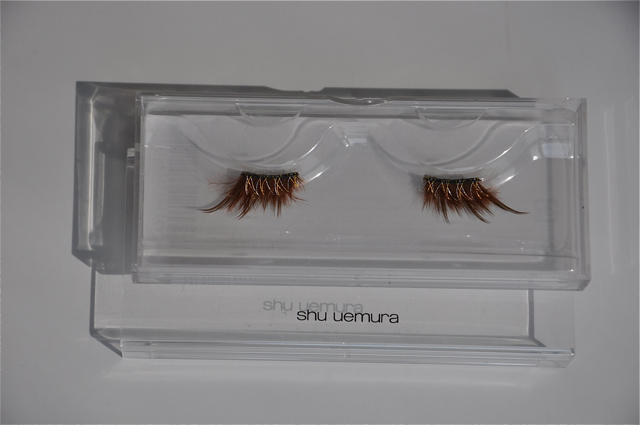 finish with shu uemura smoky layers false eyelashes. 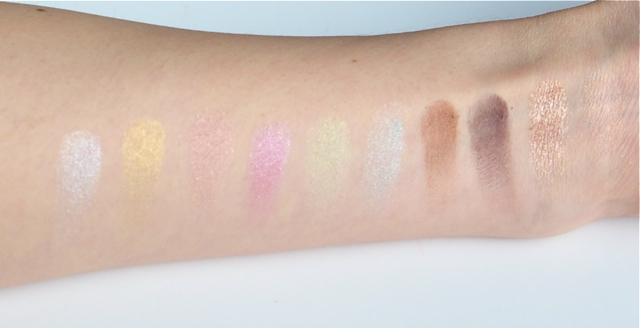 left to right: ME light silver 935, ME soft gold 335, P light coral 131, ME soft pink 155, P light green 520, P light blue 611, P medium brown 875, P dark plum 790, ME light beige, 825, P light beige 822.
i’m using one of the 19 new shu uemura lipstick shades. 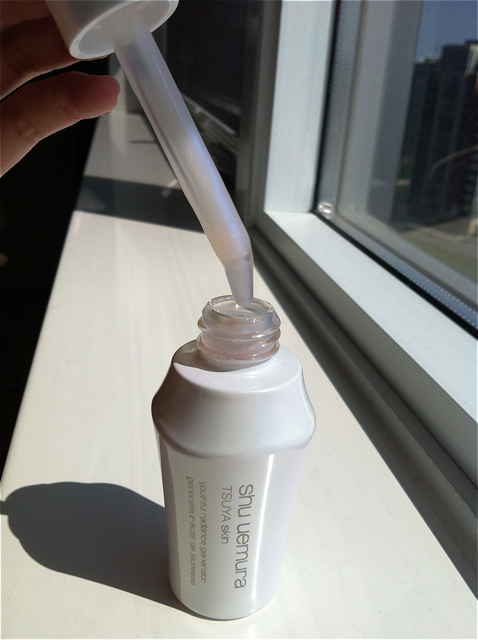 its improved formula has much higher colour payoff (higher coverage) and is more moisturizing than the previous formula. it also has great staying power. the colour i’m using is PK320 (seashell pink). the colours always look brighter in the tube, but look super natural when applied to lips.